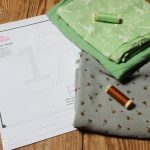 Before we start sewing, I wanted to mention one last point for preparation. Silk fabric is often very slippery and tends to shift. 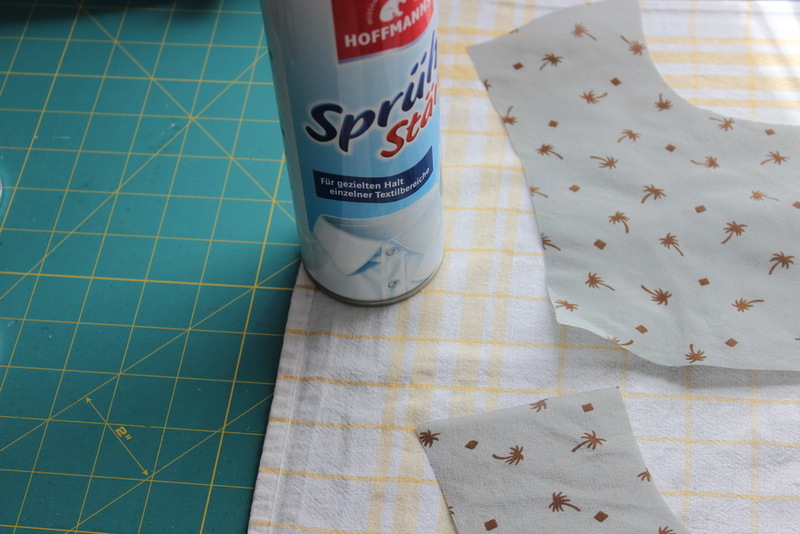 To make life easier, you can use spray starch. This makes the silk stiff and easy to handle. After finishing the garment simply wash out the starch. Be sure to test this treatment on a scrap first. 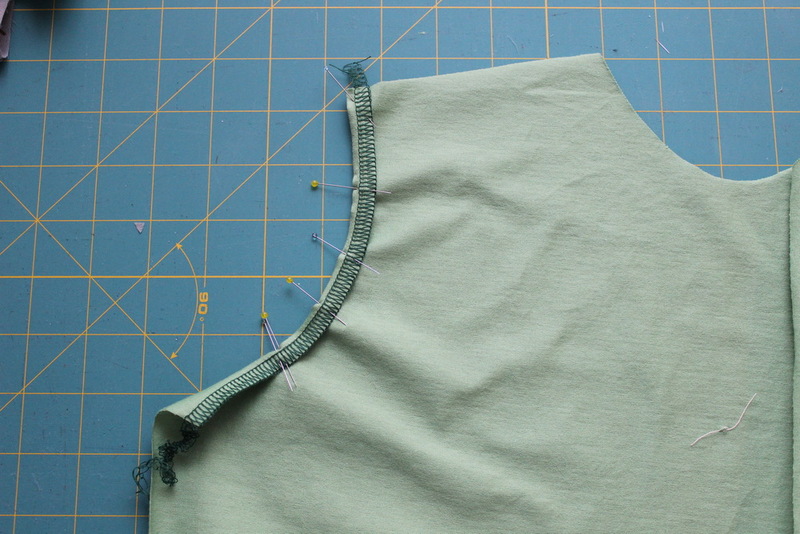 The first step is to staystitch the neckline to prevent that it stretches out. 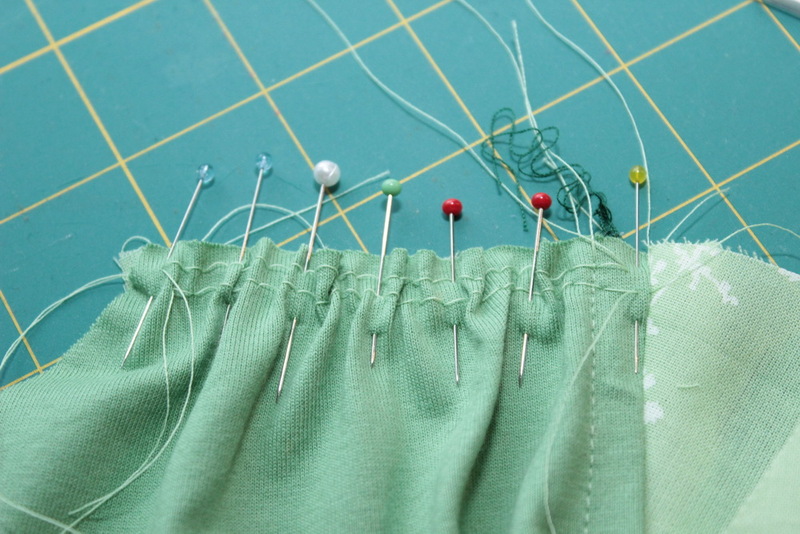 It is important to sew in the same direction for both sides, this means from the shoulder to center front. 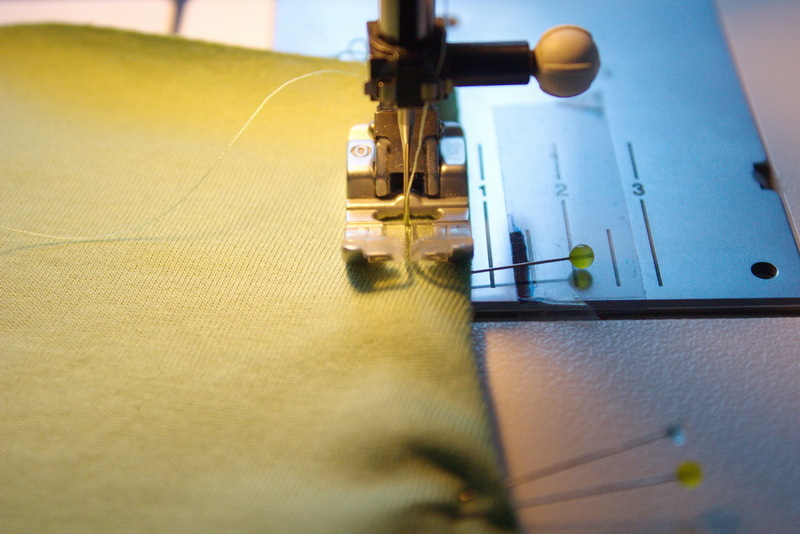 The keyword is “directional stitching”. Here is a nice article which explains the background a bit. 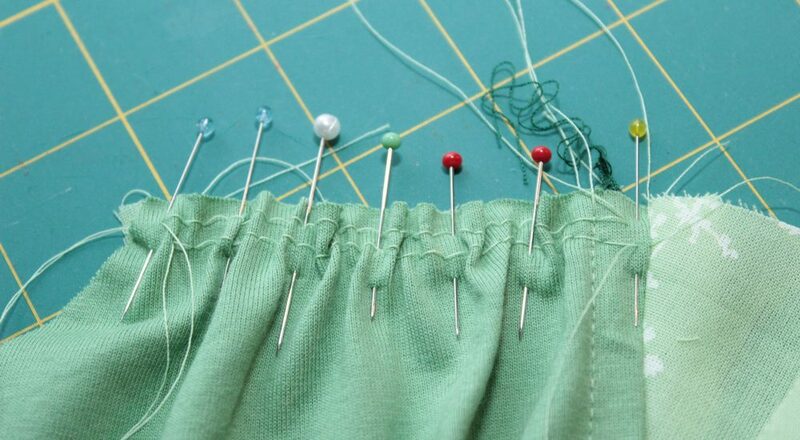 You should always keep in mind this principle while sewing. 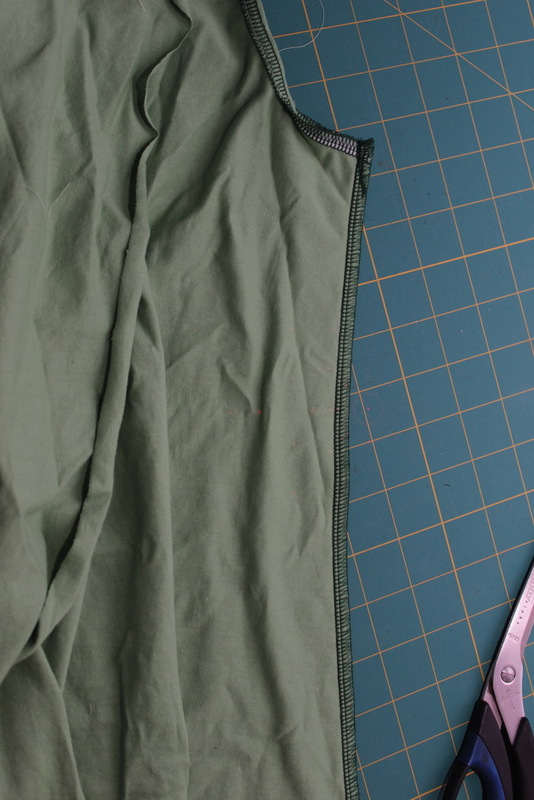 This method is as described in the pattern instructions. 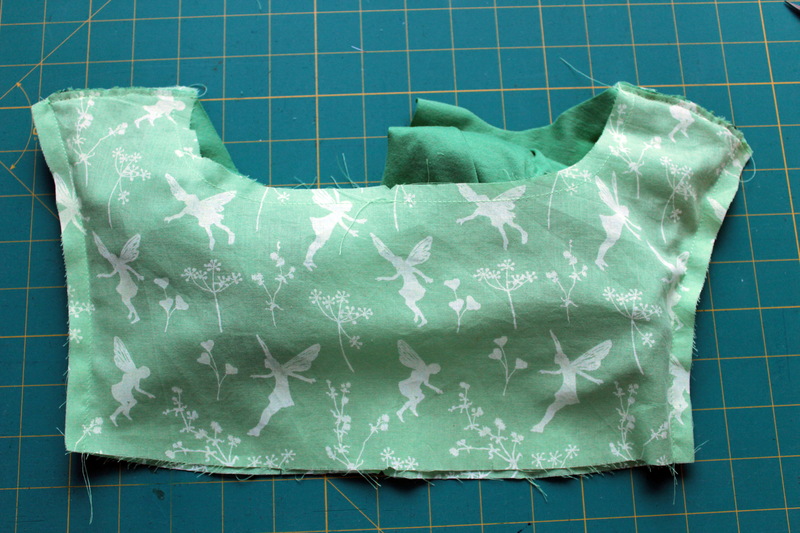 Armhole edges from yoke and bodice are finished separately. 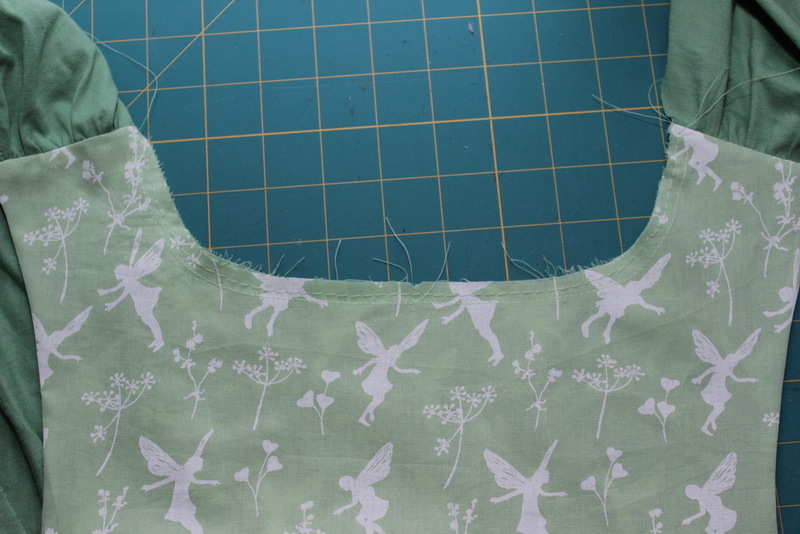 First put your yoke pieces with right sides together and stitch along the armhole edges. 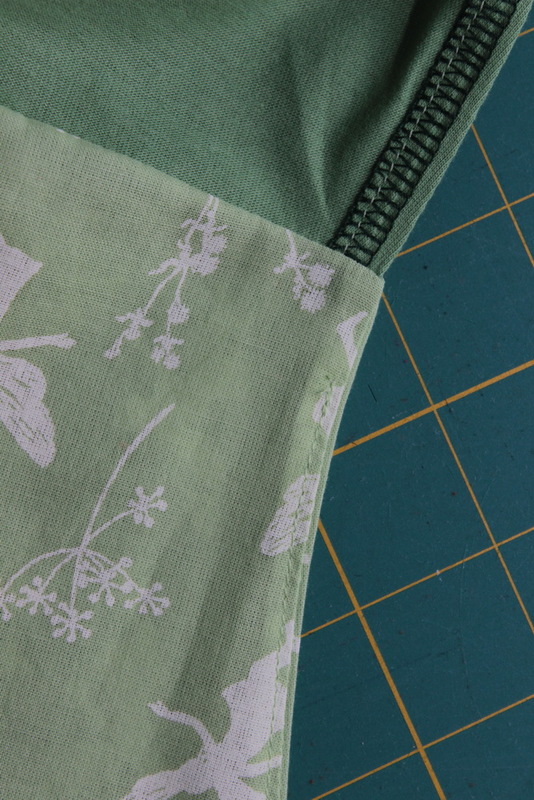 …and applied it onto the left side of front and back along the armhole edges. 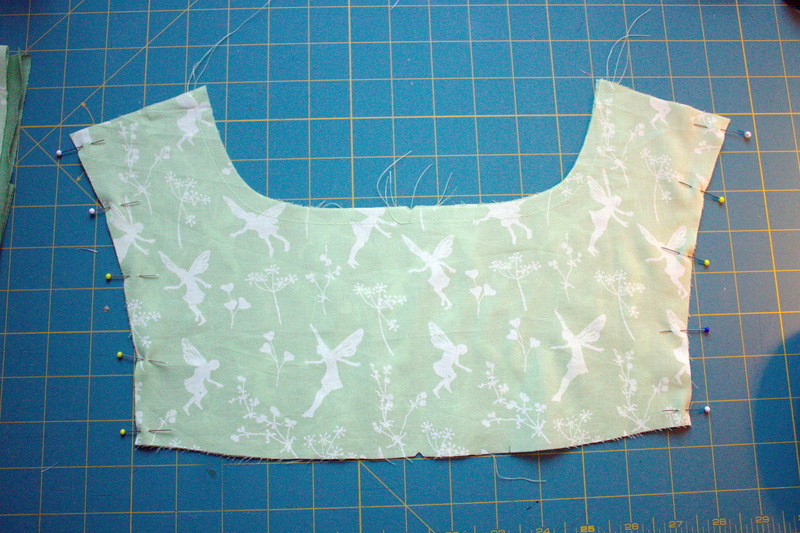 I finished the edges with my serger. 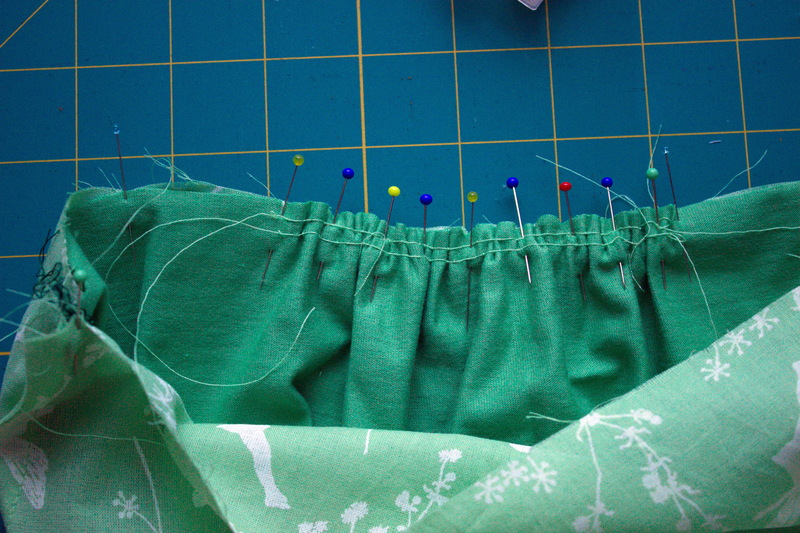 As the fabric would not fray, this step is not necessary, but I think it just looks nicer on the inside. 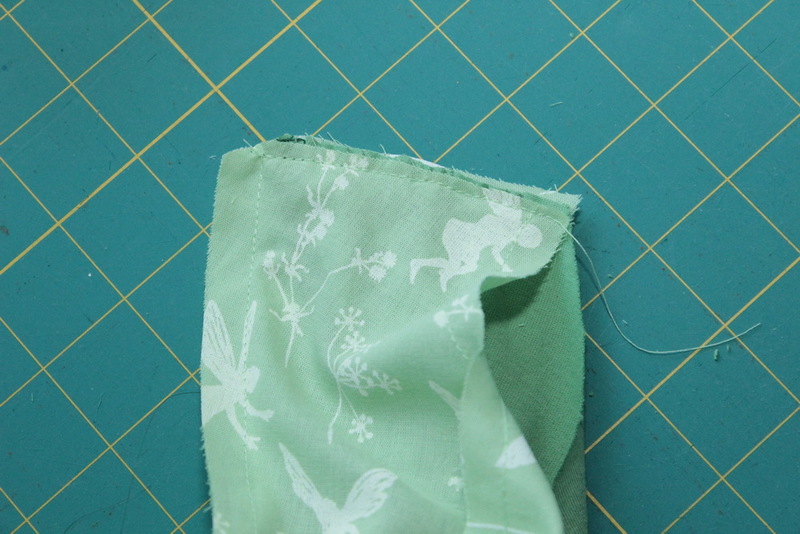 Then turn the seam allowances to the inside and topstitch along the edge. 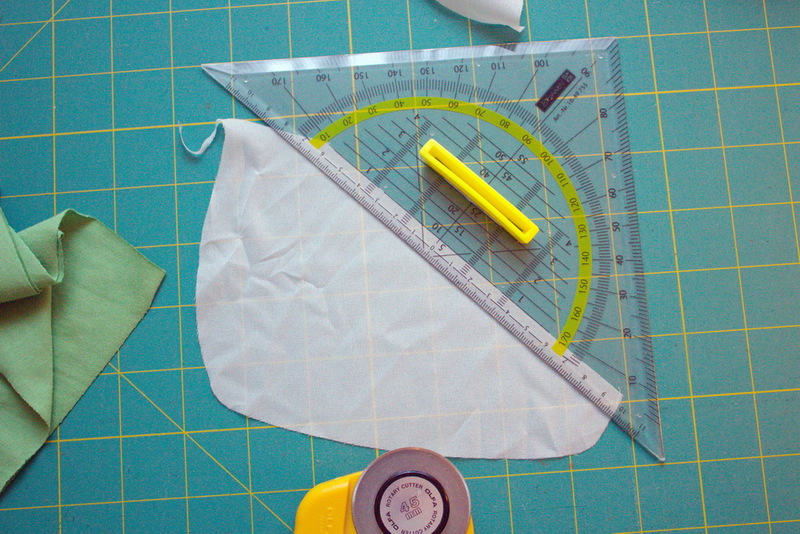 The last 5 cm (2″) towards the side seam are kept free. I marked this point with two pins. 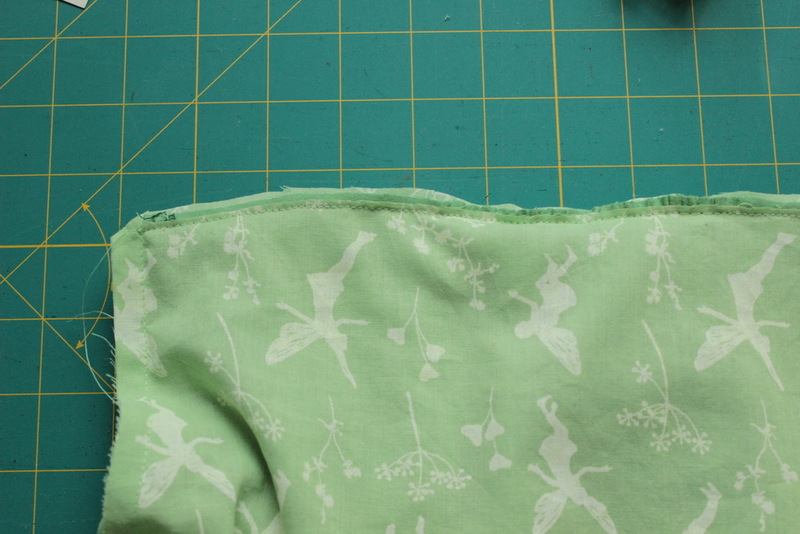 I topstitch from the right side as the stitches my sewing machine makes on the left side don’t look as nice. 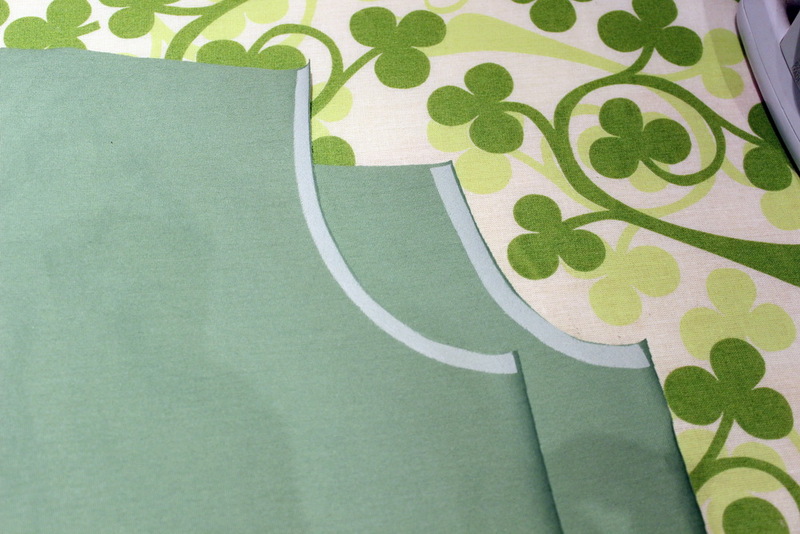 Now we prepare the bodice pieces for gathering. Stitch two rows with a big stitch lenght and decreased thread tension along the shoulder seam of the front and between the notches of the back. Now we take one front piece and slip it between the yoke pieces. 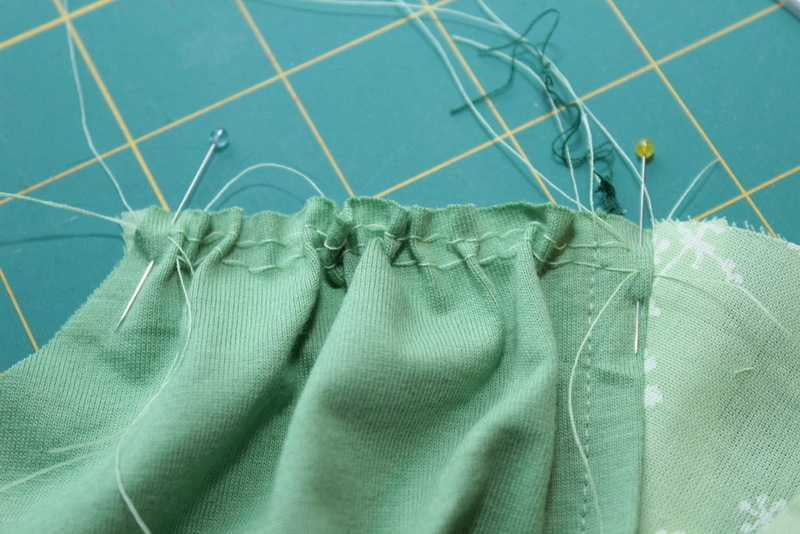 It is very important that the armhole edge is pushed as near as possible to the yoke seam. 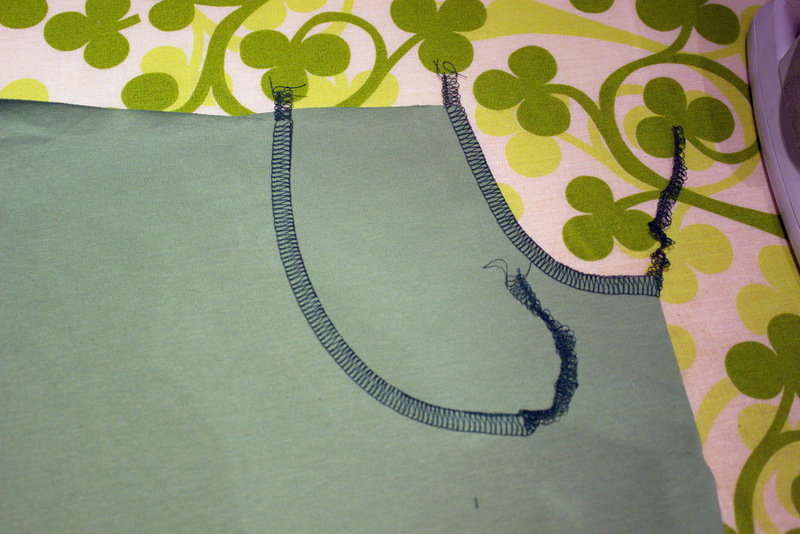 The left side of the front piece shows to the inner yoke. 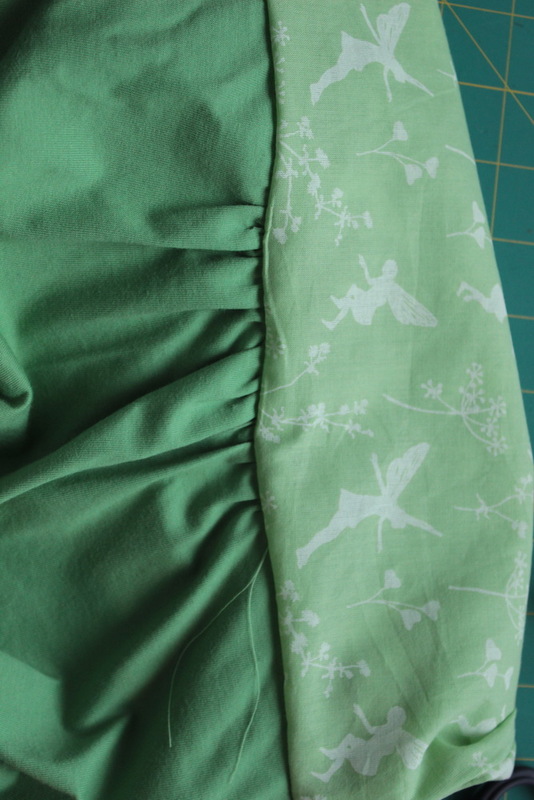 If both yoke pieces are from the same fabric, it does not matter how the front is aligned. 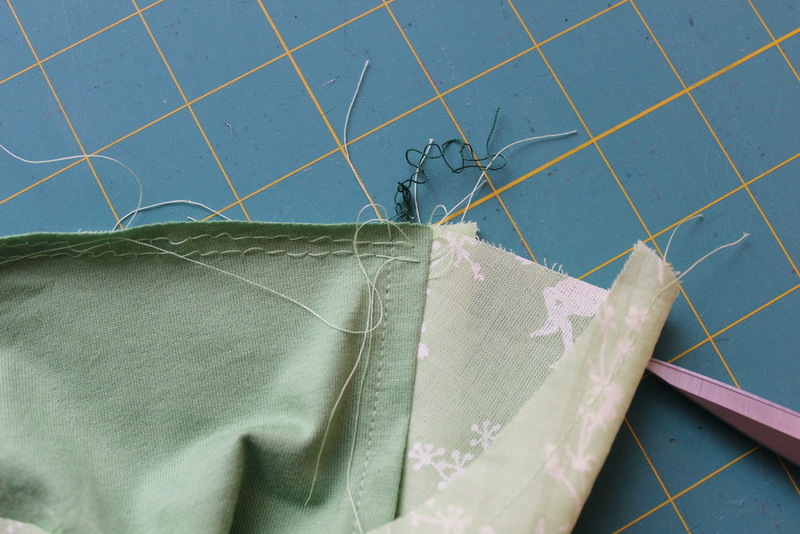 Before I pull the threads for gathering, I pin the front at the left and the right. This way I know how much I have to pull my threads. With a bit of patience distribute the gathers evenly and pin. 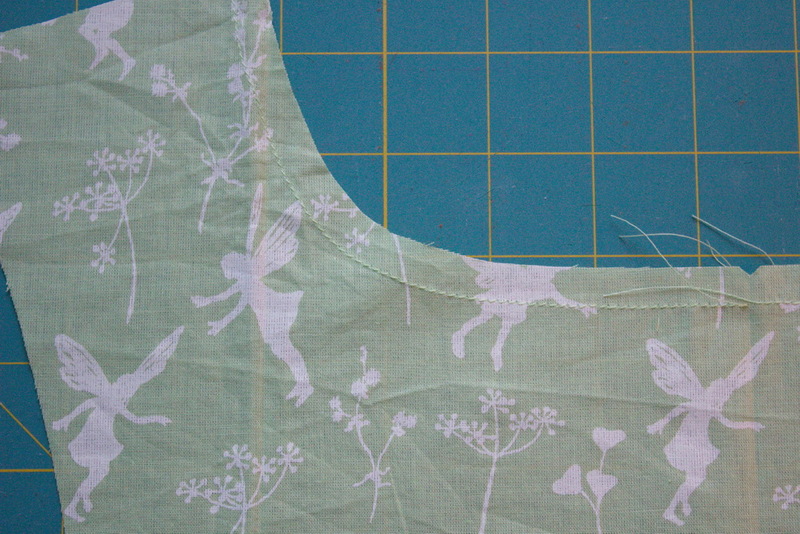 Then I put the other yoke piece on top again, pin and stitch through all layers. Before grading the seam allowances I turn everything right side out to check if I am happy with the gathers and the intersection of yoke and bodice. 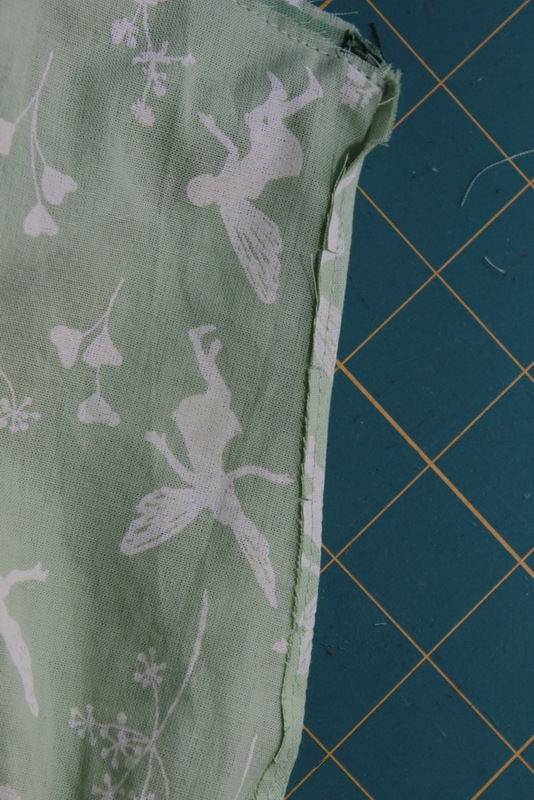 Looks good, so turn inside out again and grade the seam allowances. When grading seam allowances, the outermost seam allowances that is the seam allowances facing the outside will stay widest. Do the same for the second front piece. Then roll up both front pieces and put them inside the yokes so they stay out of the way. 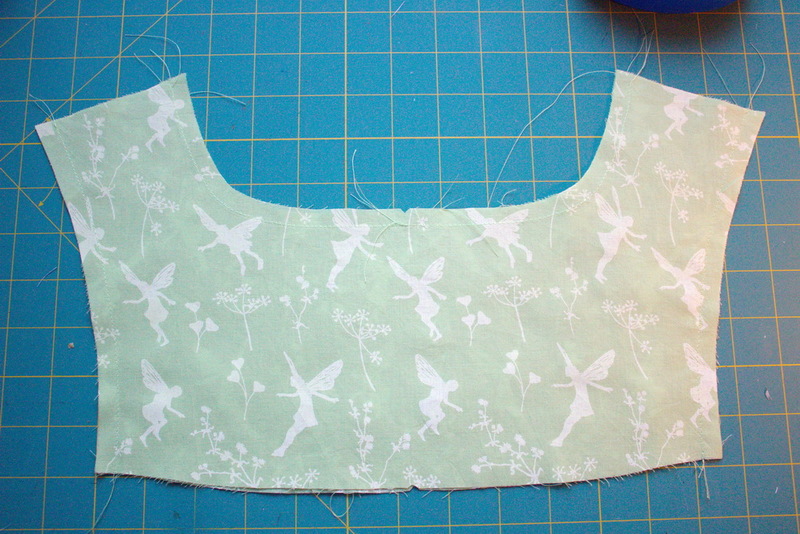 Now we slip the back piece between the yoke pieces from the direction of the neckline. 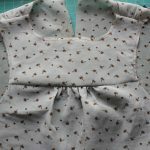 The left side of the back is facing the inner yoke. Slip the back the whole way through the yoke. Align center back and notches of back and yoke. Pin. 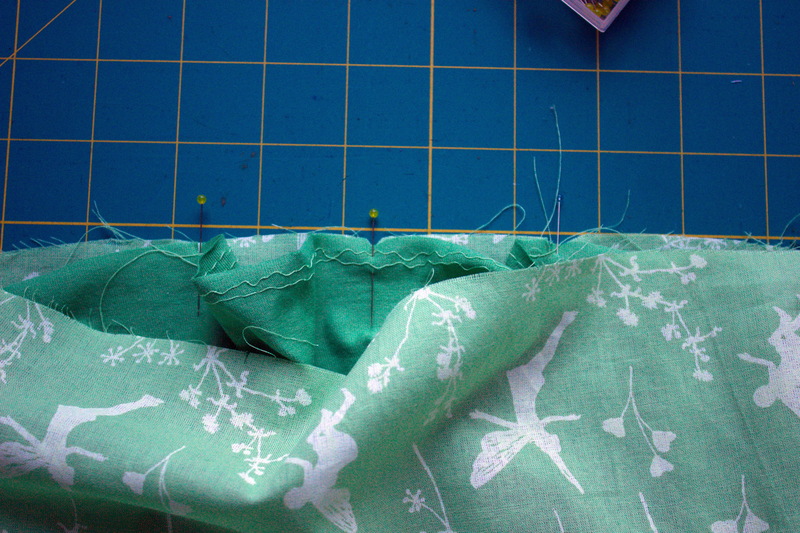 Pull the threads and distribute the gathers evenly. Pin a bit more…. 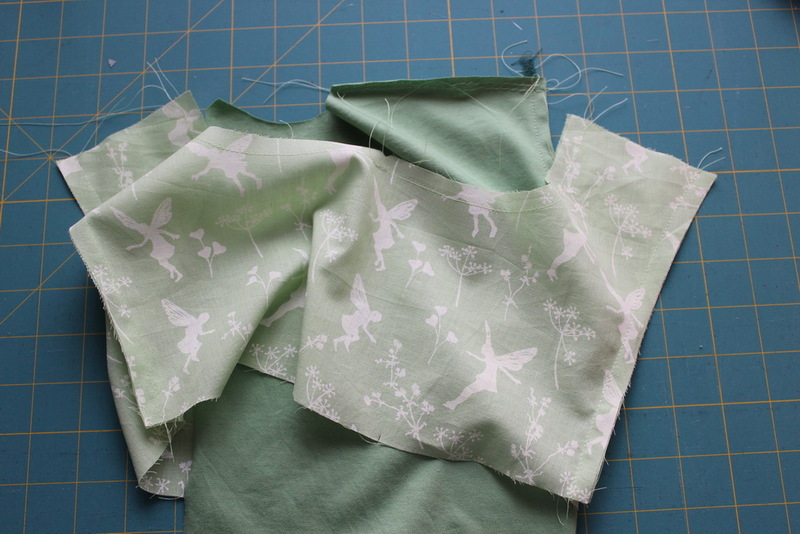 ….put the second yoke piece on top, align and stitch through all layers. 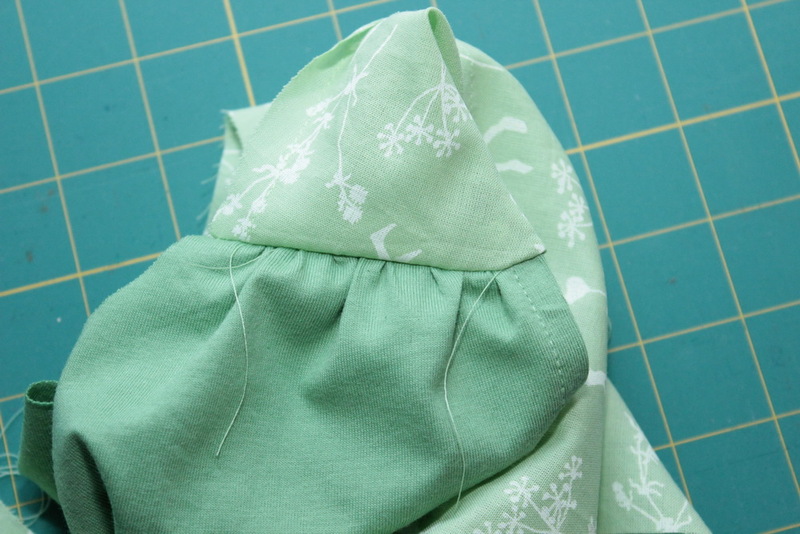 Again be sure that the armhole edges are pushed as near to the yoke seam as possible. I turn everything right side out to check if I am happy with the result. 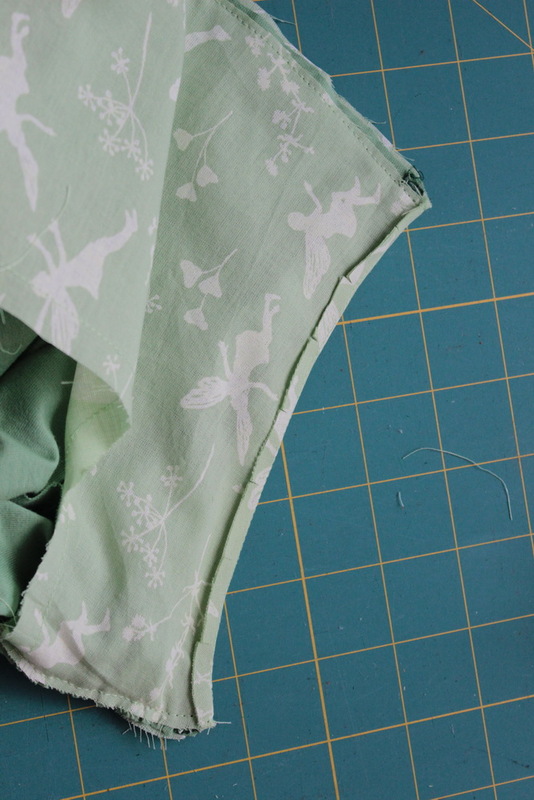 Turn back inside out and grade the seam allowances. 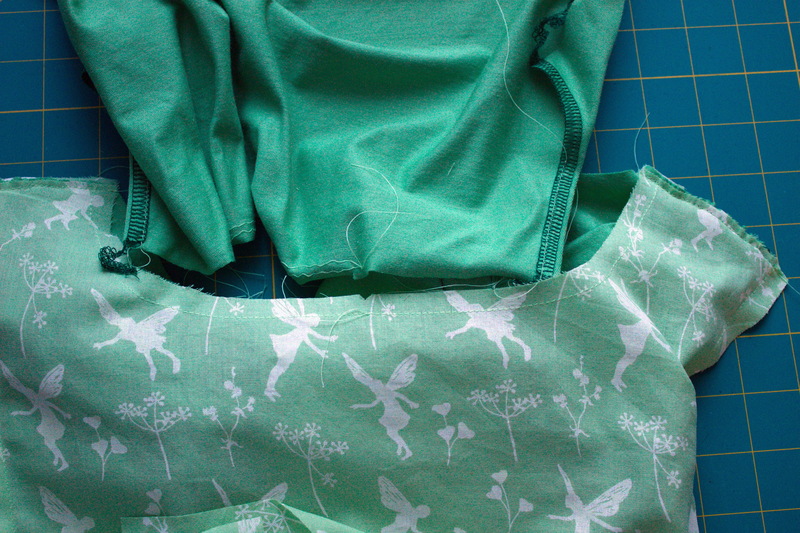 Then clip the armhole seam allowance of the yoke pieces and press them towards the inner yoke. 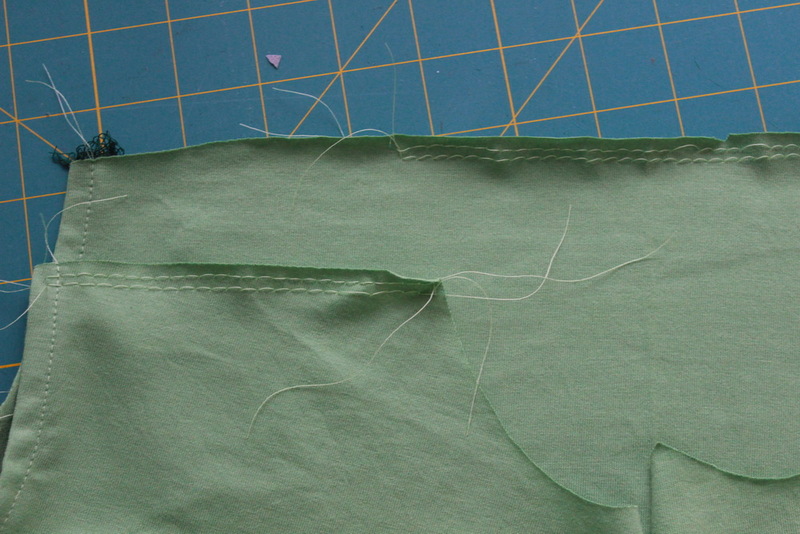 To keep the seam allowance in place it will be unterstitched. 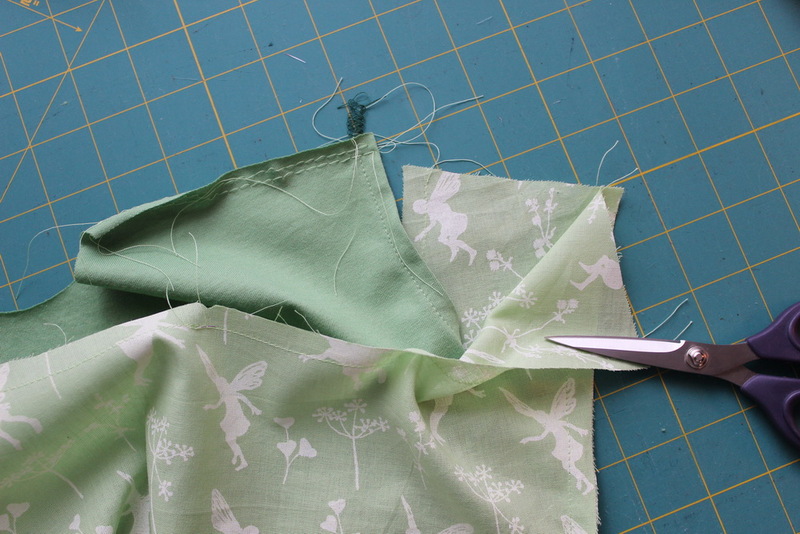 This is a bit tricky and you won’t be able to stitch along the complete seam. 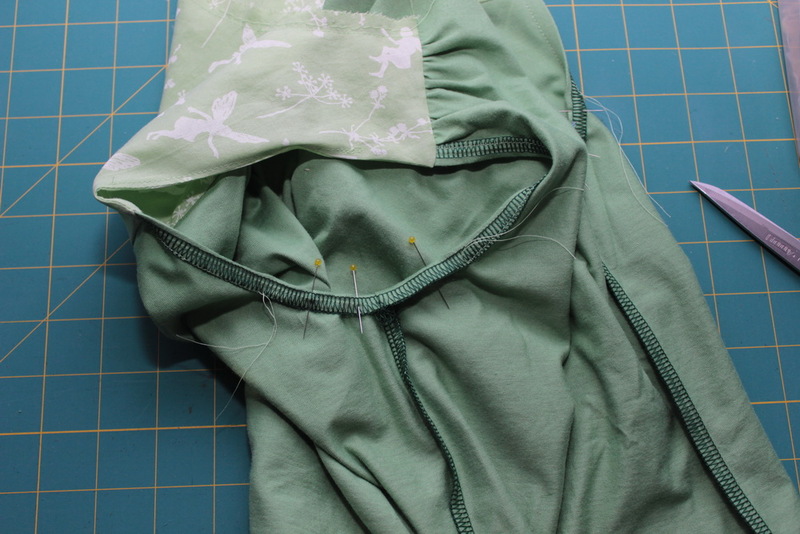 The seam allowance is stichted to the inner yoke only. I put the yoke under my sewing machine in a way that the seam is in the middle of my presser foot. I shift the needle towards the inner yoke, in my case to the left. While sewing I take care that both yoke pieces are smooth. Now we are nearly there. 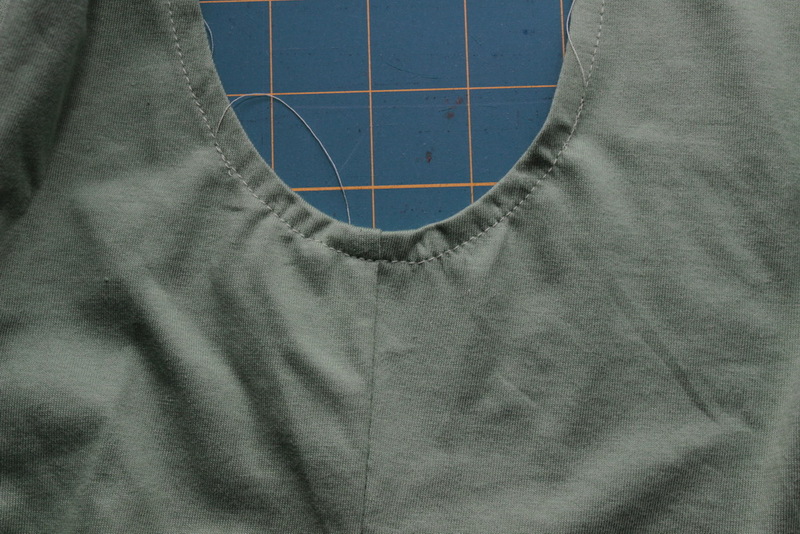 Both yoke pieces are basted together around the neckline. Now we can close the side seams. 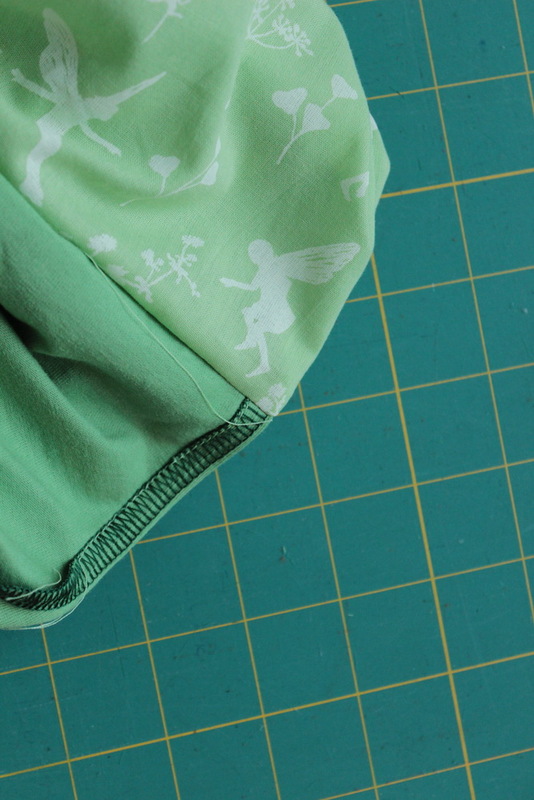 Make sure that the seam allowances of the armholes are kept open. You remember that we did not stitch them down the whole way. 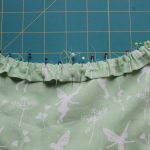 I finished the side seams with my serger. 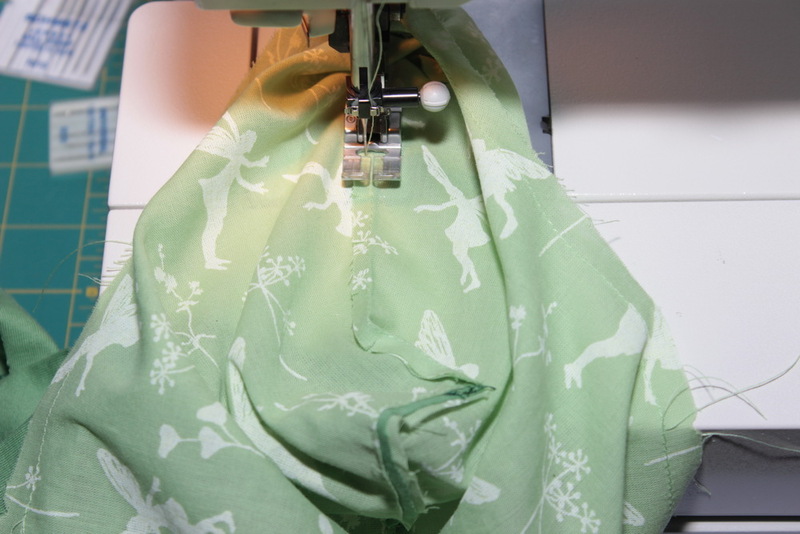 Turn the armhole seam allowances to the inside, pin and topstitch. 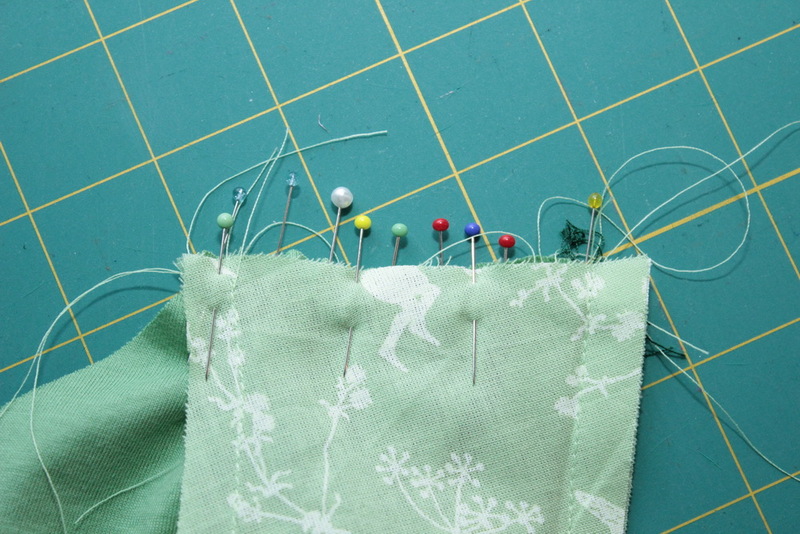 I don’t backstitch here, but pull the thread ends to the inside and tie them of. This is all for today. I will show you the second method how to construct the yoke tomorrow.